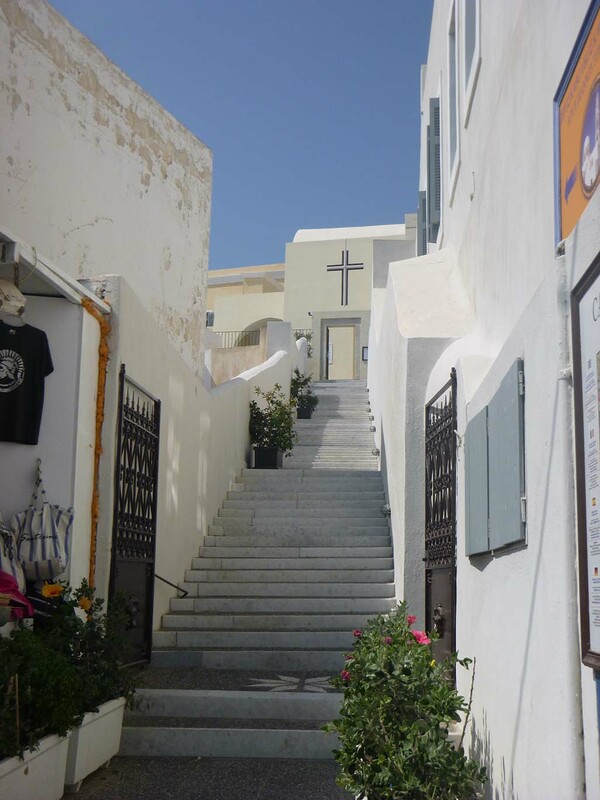 When the ship dropped anchor in the Aegean Sea off the island of Santorini on the fourth day of our Mediterranean cruise, we had a fantastic view of charming white-washed buildings on the mountain top — and the surrounding deep blue water. 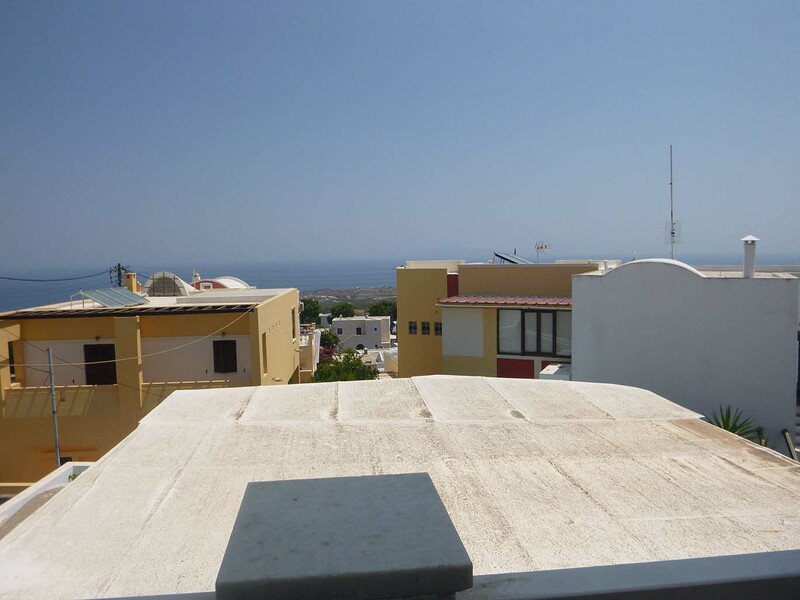 We were surprised, though, that the houses weren’t built all the way up the side of the mountain from the bottom to the top like they are in the typical photos of the Greek Islands (including the one in the Celebrity cruise line shore excursion guide). And there were no blue-domed churches, either! But it was still breathtaking. 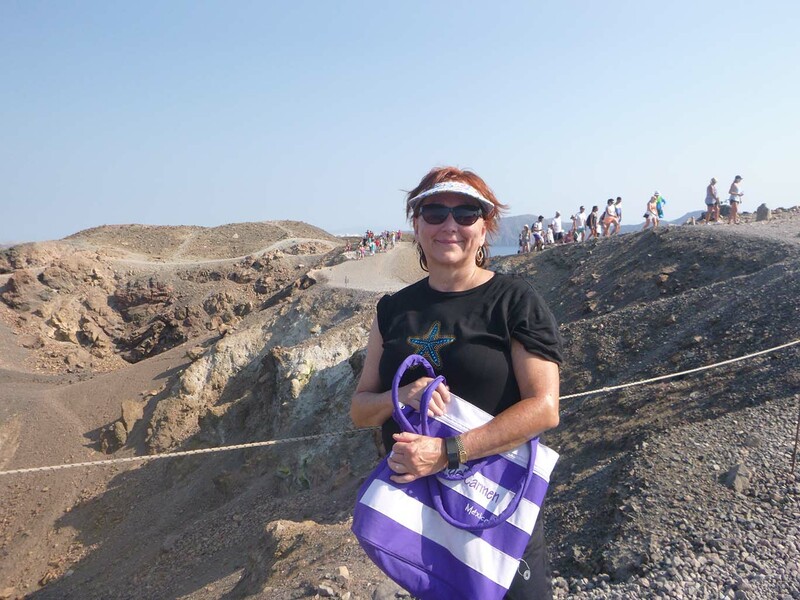 On our marathon eight-hour shore excursion, the first thing we did was take a tender from the cruise ship to the island and then board a wooden sailing vessel for a hike up an active volcano. Our tour guide (who my friend described later as “a drill sergeant”) had us walk straight uphill, nonstop, over crumbly, rocky terrain for a mile or so as soon as we got off the boat! It was very, very hot and humid, and there was no shade — just lots and lots of rocks and hills. We saw several places on the hike up where steam was escaping from the rocks, and we could put our hands down and feel the heat and pressure coming from inside. That was kind of freaky. Other than the steam, there wasn’t anything particularly volcanic (to me) about the volcano (although the surface did make you feel like you were on the moon). But there was an incredible view from the top! 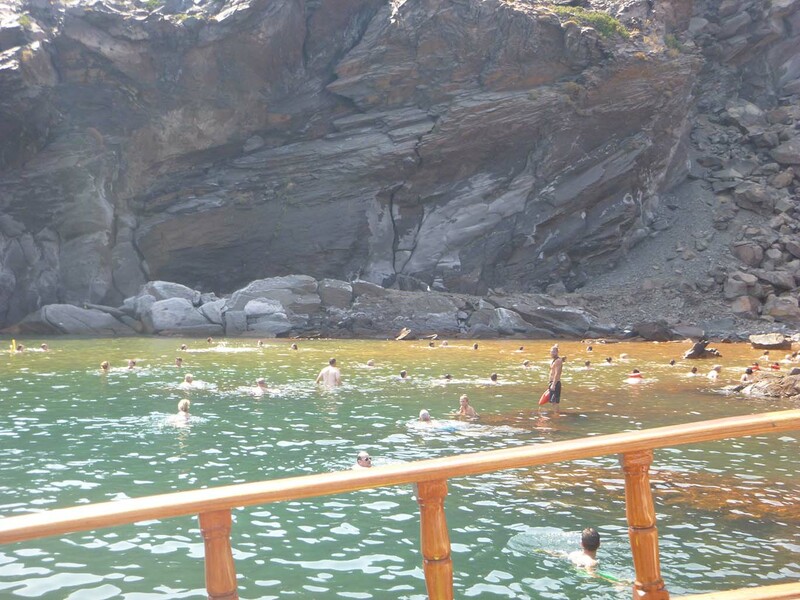 The shore excursion guide stated that we’d have the option to swim in a volcanic pool, which we both thought would be at the top of the volcano from their description, so we were kind of surprised to find no water there. Instead, we hiked back down the volcano, and got on the boat again. 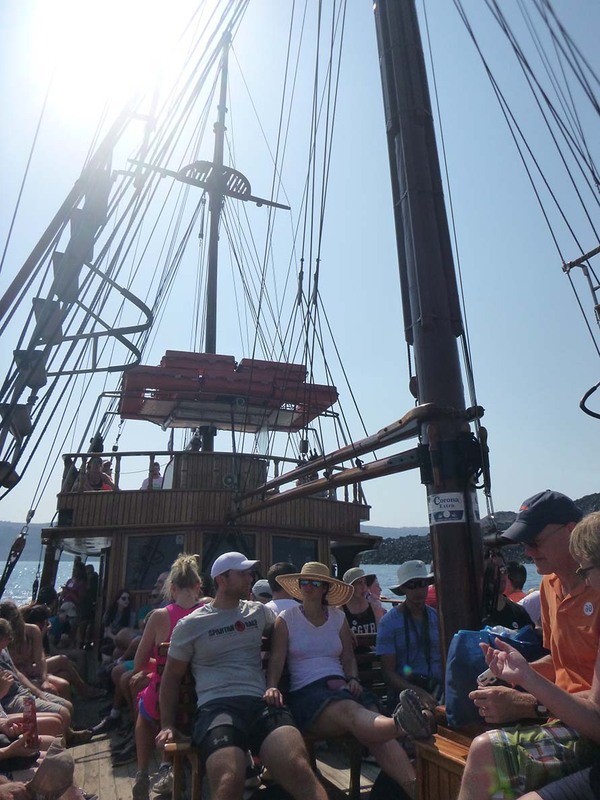 This time, we sailed a ways and dropped anchor about 50 yards from a rocky cove. The tour guide pointed out some brownish water next to the rocks and said that was the volcanic springs. (Surprise!) She then invited everyone to jump or dive off the side of the boat and swim about 50 yards to the springs. So, everyone else dove into the water and swam away, but M and I found a shady part of the boat and drank cold Diet Cokes instead. After the trip to the springs (which everyone said was filled with mud), we headed back toward the capital, Fira, a lovely village high on a mountaintop. 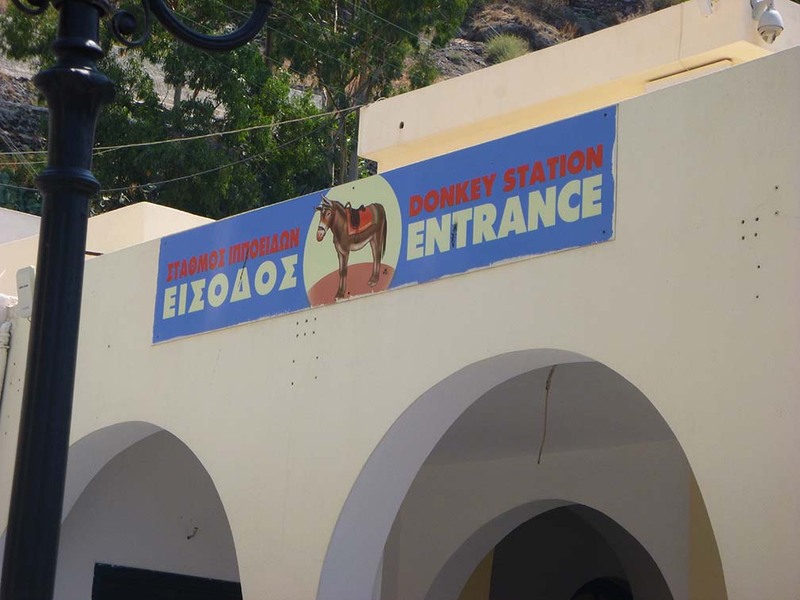 There are only three ways to get to the mountaintop: by burro (yes! 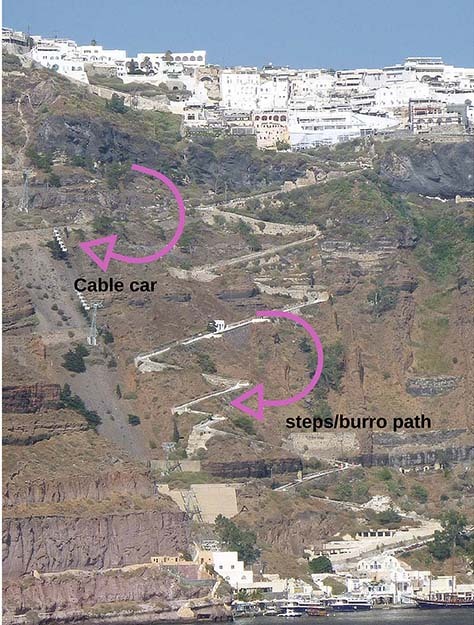 ), by walking up 587 steps (which the burros also climb) on an extremely windy staircase or by cable car. Fier was totally charming. 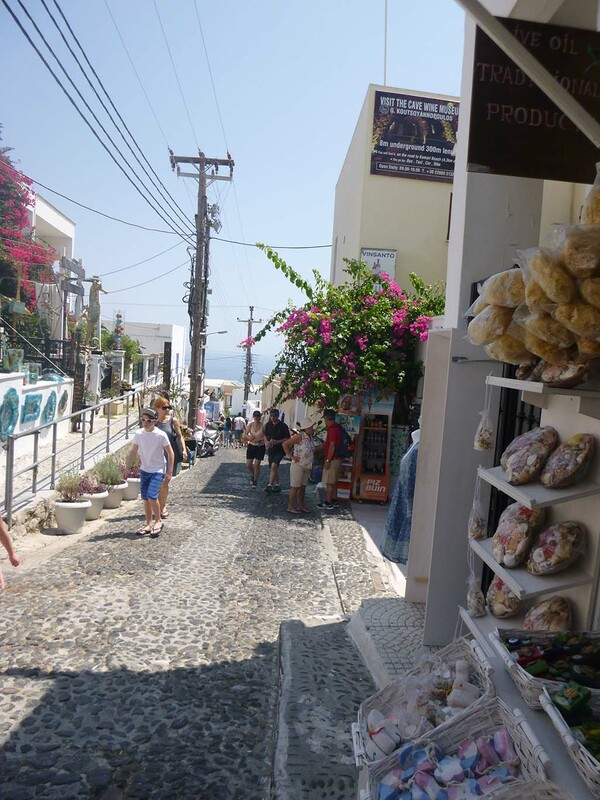 There were tons of cute little tourist shops with various types of authentic Greek wares, as well as restaurants, hotels, cobblestone streets, abundant flowers, houses and white domed churches. 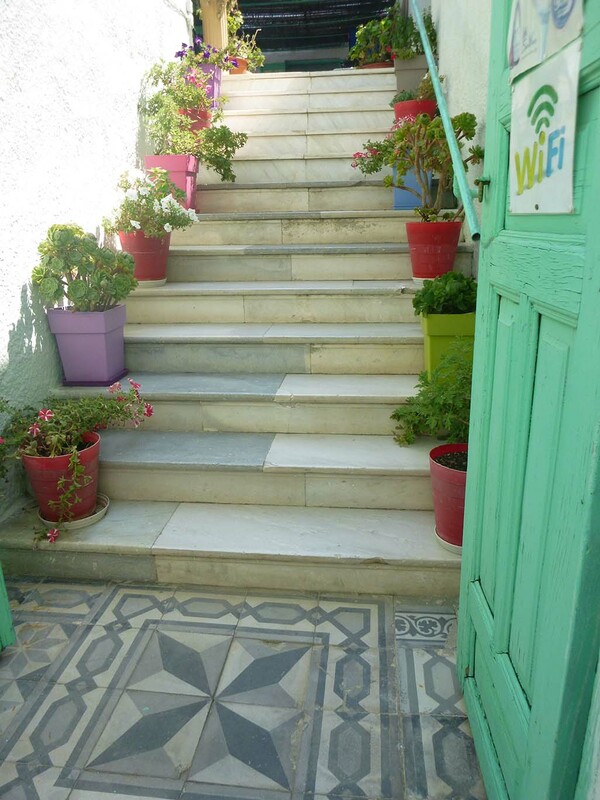 We wandered the streets a while and had lunch in a quaint, elevated open-air Greek restaurant that had a great view of the sea below. Eating there was very, very cool. We shopped a while and then had a Coke in a restaurant with wifi and sent a few emails home (using the international Verizon plan!) to tell everyone how much fun we were having. After that, we decided to head toward the cable car, giving us an hour and a half to make the last tender back to the cruise ship. To our dismay, the line of tourists who were also waiting in the extreme heat to get to the cable cars wound through most of the main shopping area and down a long side street. It was unbelievable! 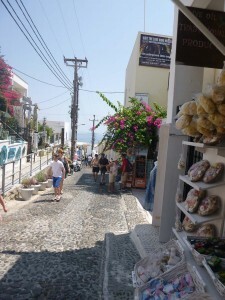 While we waited, we saw two men straining to carry a woman who looked like she had a sprained ankle in a wheelchair three feet over the cobblestone streets, since it was too rough to push it. We thought she must’ve faked an injury because she was tired of waiting in the heat in the long line — and we felt really sorry for the men carrying her. Forty-five minutes later, parched and sweaty, we arrived at the cable cars. The crowd and the heat that day was a real experience! I can’t remember being much hotter than that in my entire life (and I’ve lived in the deep South more than 20 years). 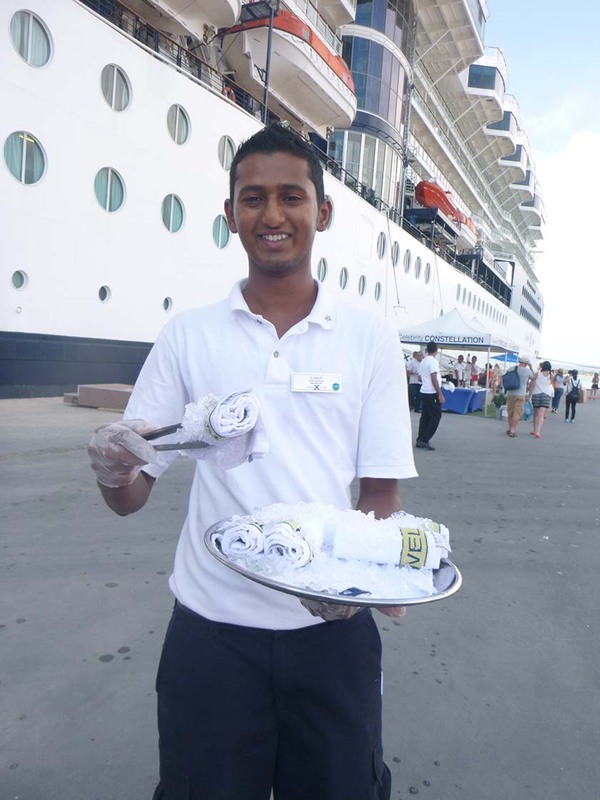 However, cruise line employees were handing out iced face cloths and cold cups of water to passengers as we returned to the ship, and that made everything alright. To complete the cool-down process, we rushed to a bar and each had a refreshing frozen strawberry daiquiri! 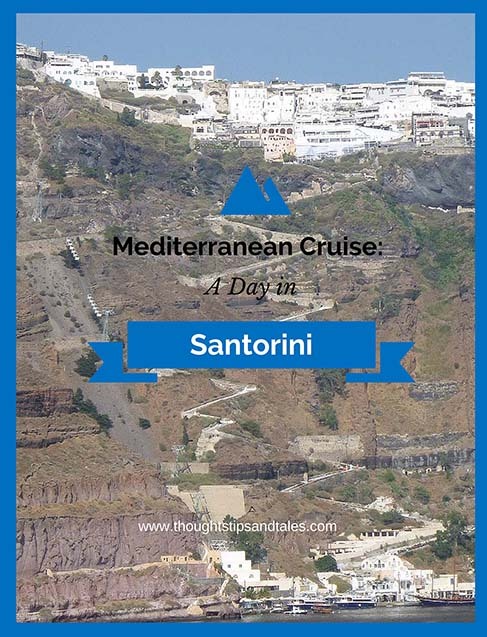 This entry was posted in cruising, Fier, Greece, mediterranean cruise, Santorini, vacation and tagged cruising, Fier, Greece, Mediterranean cruise, Santorini, vacation. Bookmark the permalink.